Many buyers want the benefits of owning but still need financial help. 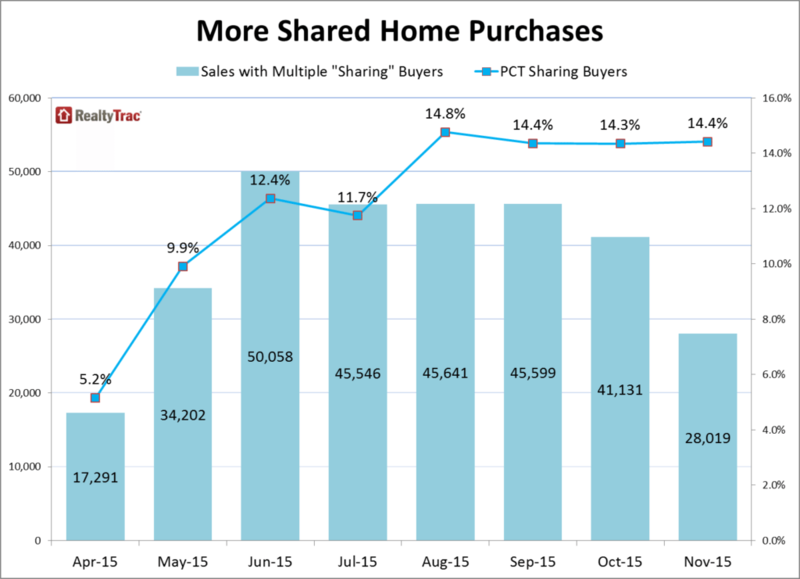 Home sales involving shared buyers are becoming more common. More millennials are purchasing investment properties after graduating college and getting a job but prior to getting married. The dream of homeownership is alive in Portland, Oregon, for Rhea Hindemit — thanks to a shared home purchase involving both her boyfriend and her dad. “I have always wanted to buy, understanding that it is a great investment,” 34-year-old Hindemit wrote in an email recounting her path to purchasing a home in November after renting for seven years. “Why not be paying into an investment for the future rather than giving our money to a landlord? “In addition, because of skyrocketing rents, being a renter was not a stable way to live,” Hindemit said. “We were in constant fear of steep hikes or no-cause eviction. Although Hindemit and her boyfriend had some savings to go along with their desire to become homeowners, they still needed some additional financial help to make that dream a reality. This help came in the form of an equity share agreement with Hindemit’s father, who furnished the down payment for the home. In exchange, he is listed on title as a co-owner and also receives a modest monthly rent from Hindemit and her boyfriend. The number of home sales involving shared buyers like Hindemit, her boyfriend and her father are becoming more common, according to a RealtyTrac analysis of sales deed data over the past year. In November, 14.4 percent of all residential property sales nationwide involved multiple buyers with different last names, the fourth consecutive month where that percentage of shared buyers was above 14 percent following nine consecutive months below 14 percent. In November, 14.4 percent of residential property sales involved multiple buyers. After dropping to as low as 5.2 percent in April 2015, the percentage of shared buyers steadily increased — reaching a peak of 14.8 percent in August. Read more about U.S. and local trends in shared homeownership. The equity share arrangement used in the Portland purchase is mutually beneficial to both parties, according to both Hindemit and her father, David Dufresne. For Dufresne, a real estate broker in the East Bay area of Northern California, the equity share arrangement helps him avoid some of the tax trip-ups involved in gifting a down payment while also helping him secure an investment property that generates some monthly cash flow with the opportunity to share in future appreciation. Learn more about how equity share agreements work and view a sample equity share agreement. On the other side of the country in Boston, Leland and Suzanne DiMeco, co-owners of Boston Green Realty, said they are noticing more millennials purchasing investment properties after graduating college and getting a job but prior to getting married. “When two guys buy their first multifamily, which is probably about as scary as getting married, and they have success, word gets around pretty quick,” said Leland DiMeco. He was recounting one example of two college buddies he helped in purchasing a two-family home in the town of Medford so they could be closer to the city and to the jobs they had just landed. The two friends shared the first floor of the home and rented out the second floor. Rising home prices that are becoming less affordable for young, single buyers is part of the reason for the rise in shared buyers, Leland DiMeco said. The rise in shared home purchases is also being driven in part by a cultural shift among younger buyers who are more open to living in close quarters and willing to sacrifice space for closer proximity to the amenities they have enjoyed as renters, according to Suzanne DiMeco. More on millennials buying investment properties before marriage. Real estate broker Edward Krigsman sees many of those same forces at work in Seattle, where 29 percent of residential property purchases in November were to shared buyers, according to the RealtyTrac analysis — the fourth highest among cities with at least 250 sales during the month. “People really don’t want to spend more than a third of their income on housing,” said Krigsman, managing broker with Windermere Real Estate covering neighborhoods close to the center of the city of Seattle. One of the solutions to the affordability crunch in Seattle is to share the cost of homeownership, which Krigsman said is happening for different reasons among two distinct groups: millennials who have delayed homeownership and international buyers who are seeking a safe haven for their cash. One of the solutions to the affordability crunch is to share the cost of homeownership. “In the last year I’ve noticed more millennials or their parents calling me and saying … my son wants to buy a house, and we’re willing to help with the down payment. He’s been living with several other friends in an apartment … and they want to continue to live together,” he said. Read full article from Housing News Report.